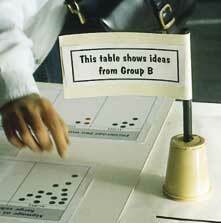 Table scheme displays allow large numbers of people to understand and make an input into development proposals, with or without engaging with others. They can be used as part of an exhibition or open house event. Drawings or models of a proposed scheme are placed on a table with the main elements identified on separate voting sheets around the edge. Separate tables can be used for different scheme options. People vote on what they like or dislike by placing sticky dots on the voting sheets. More detailed comments can be made using Post-it notes, either on the same tables or on separate displays. 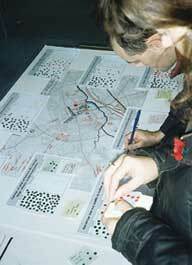 The results are analysed afterwards to inform the next stages of the planning process. Farnham, UK, 1997, Nick Wates. Voting with sticky dots on town centre improvement ideas proposed by a design workshop focusing on transport. 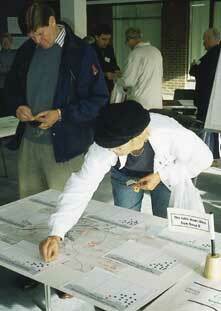 Part of a one-day open house event. Good way of introducing people to the design process. Works particularly well for getting comments on rough sketch schemes developed at design workshops. Redrawing is not usually necessary though it can help if time allows. Useful debate will invariably take place around the tables. It can be helpful to have organisers present at each table to respond to questions and to take notes. Have a spare table with a blank plan for those wanting to draw up their own ideas in more detail. Few costs involved unless proposals are professionally redrawn.